It has always pained me to buy salad greens that have been shipped from halfway around the country. In the summer, salad greens are easy to grow or purchase locally. But in these colder months, there aren’t really any local options where I live. So this winter, I decided I would grow my own baby salad greens right in my home. Even though it’s a snowy tundra outside my window, I’ve had a steady flow of vibrant microgreens, grown right on my windowsill. It’s been a very delicious (and very nutritious) adventure! I’ve often grown sprouts in a jar during the winter months which is a great source of greens, but to be honest, I much prefer biting into a tender microgreen. And if you’re wondering what the heck I’m talking about… well, a microgreen is like a sprout, but a little bit bigger. 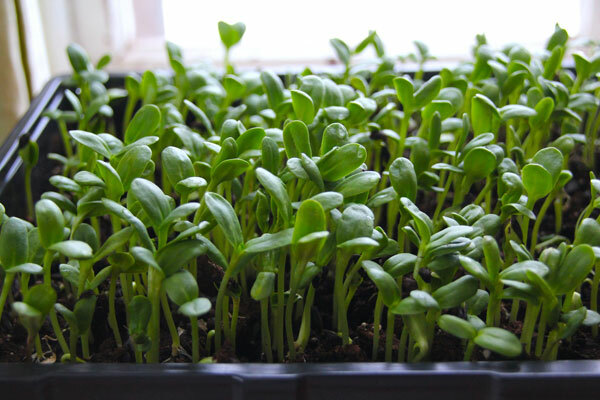 Whereas sprouts are grown with only water, microgreens are grown in a container filled with soil so they grow past the sprout stage and develop roots and their first leaves, called cotyledons. They are essentially little plant seedlings that are bursting with nutrients. You can use the exact same seeds you would use for sprouting or gardening, from radish to arugula seeds, sunflower to broccoli seeds, the options are endless. 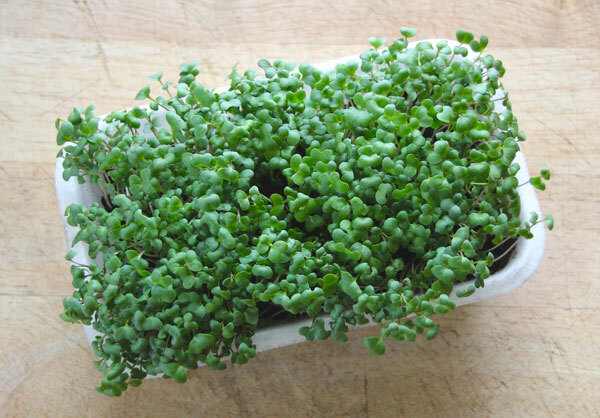 Microgreens are very popular with chefs because they’re so tasty and elegant. 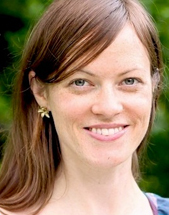 They’re often used in fancy restaurants and they can be pricey in health food stores. But there’s no need to pay a small fortune for them. 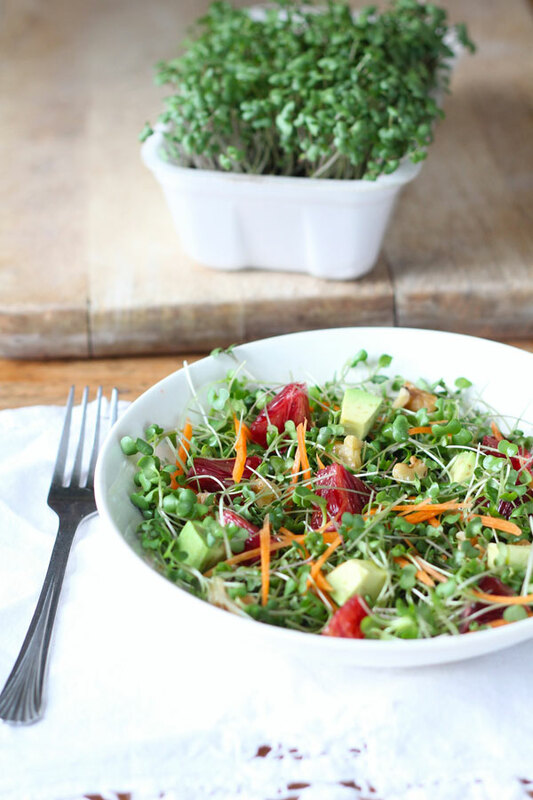 For the price of a few tubs of regular salad greens, you can grow enough microgreens to enjoy a whole winter’s worth of salads, packed with top-notch vitamins, minerals, and phytonutrients. If you’re thinking this is too complicated, and you don’t have the right tools and equipment… stop! Don’t go anywhere! 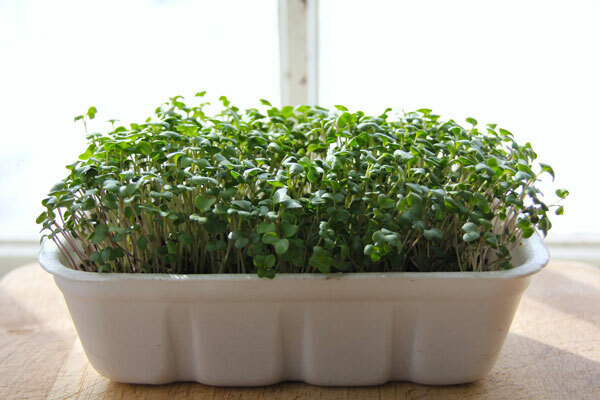 You can grow microgreens in any shallow container that is at least 1 1/2 inch deep. I like to reuse those styrofoam or plastic containers that mushrooms are sold in. They’re the perfect size, they just need a few holes poked in the bottom for drainage. A plastic cover is not essential but is recommended to create a mini greenhouse-effect. I simply use those plastic tubs that baby spinach and greens comes in, they have just the right depth to cover your little styrofoam mushroom container. Make sure your container has holes in the bottom for drainage. Fill the container with seed starting soil (preferably organic) to a depth of 1 to 1 1/2 inch. Smooth and flatten the soil down with a piece of cardboard so the soil bed is flat and even, but not compacted. Sprinkle a generous amount of seed on top of the soil bed. The seeds should almost cover the soil to ensure a dense lush growth. Sprinkle a very light layer of soil on top of your seeds (the soil covering the seed should only be as deep as the diameter of the seeds you’re using). Pat it down gently. Water the soil well (excess water will drain out so place your container on top of a draining tray of some sort). If you have a plastic lid, cover the container to create a mini-greenhouse effect. Place your seeds in a dark warm place until they germinate. As soon as your seeds have germinated, move your tray to the sunniest location you can find in your home (the more sunlight, the better) and watch your babies grow! Keep the soil moist and watered and your microgreens will be ready in 7 to 14 days. Harvest by cutting them with scissors, about an inch below the leaves. If you’d like to know more about growing microgreens, this wonderful book is a wealth of information on how to do it at home, with expert tips and gorgeous photos. In fact, I’m giving away a copy this week, so stop by my blog to enter the draw! 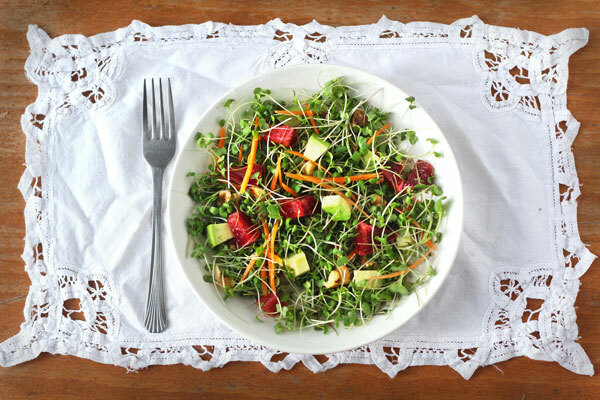 You can get creative with your microgreens to make delicious salads. I recommend sticking to a light vinaigrette, so you can taste the delicate shoots and not overpower them. I love to eat my microgreens with grated carrots, cubed avocado, raw sunflower seeds, topped with a little lemon juice and olive oil and a soft poached egg on the side. Very simple, fresh, and delicious. You feel so good after a lunch like that! The salad recipe I’m sharing with you today is variation on that theme, with blood oranges and walnuts thrown in the mix for a flavourful, nourishing and antioxidant-packed salad. 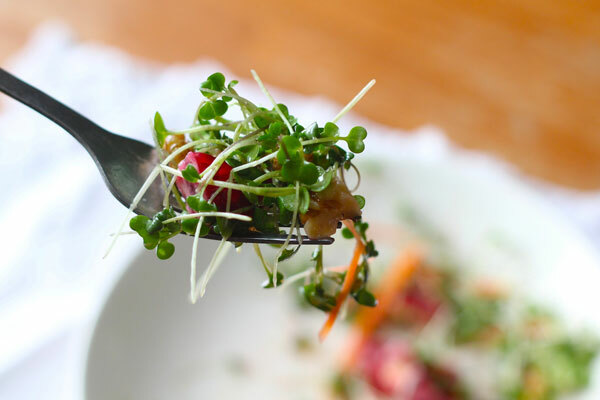 As a final note, if growing your own microgreens is not up your alley but you’d still like to try them, you can find them at some health food stores and many farmers are now growing them, so check your local farmer’s markets and ask around. 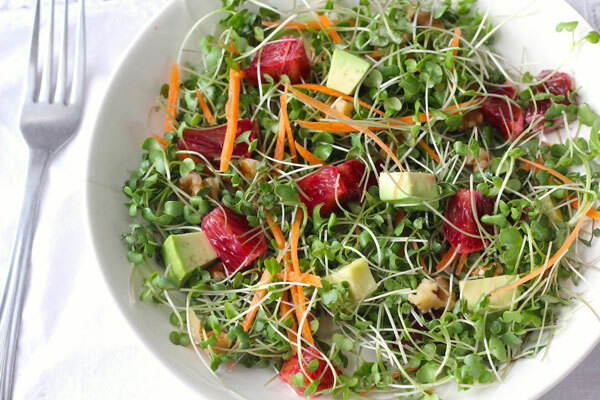 Microgreens are packed with vitamins and minerals. Learn more on the Kitchen Vignettes blog.